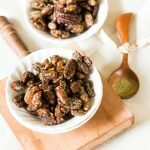 Costco strikes again as the inspiration behind these Green Tea Seasoned Candied Nuts (yes another costco mention…and no I do not receive any commission from them, although how lovely would that be, hint hint costco peoples 😛 ). Anyway I was in sample heaven when I came across one of their recent offerings – a slightly odd green tea spiced nut mixture featuring some dried apple and lemon thingy. Despite the weird combo it was delicious and I did more than one sneaky fly-by visit past the sample table – for the kids of course. The price tag was more than I was willing to fork out, given the rate at which nuts are consumed in my household, so I got to experimenting as soon as I got the chance. I came up with this little candied nuts concoction and I am totally hooked. They are EVERYTHING you need in a snack: crunchy, sweet, teeny bit bitter, oh so moreish and delicious! I used DōMatcha Organic Culinary Matcha for these candied nuts, and you can grab some for yourself here. But any organic Matcha will do, just be sure to check the ingredient list to ensure it makes you happy and there are no hidden nasties lurking in there. If you are interested in learning a bit about the benefits of matcha then pop over here and check out this post, where I give a super quick run down and share a delicious Green Tea Chai Spiced Latte recipe. Back to these green tea seasoned candied nuts, don’t you just love them? I am even oddly obsessed with the green tinge, although that was definitely a bit of a hard sell with the hubby 🙂 He soon changed his mind when he tried them though! What do you think? I love hearing from you, so if you try them out be sure to pop back and leave a comment! Happy eating. In a large bowl, or a stand mixer, whisk together the egg white and water until it is thick and foamy. You don't want it to get stiff. Spread the nuts onto the parchment paper, ensuring they are in a single layer. Pop in the oven and bake for 30 mins, stirring once at 15 minutes. The nut mixture should be brown and dry. Remove from oven and allow to completely cool before breaking up any clumps. Store in an airtight container, they should last two weeks. This would be such a fabulous recipe for a quick and healthy snack. I’m in love with matcha powder and add it to so many of my meals. I absolutley love candies nuts and this is a great idea to use the Matcha green tea. I have never cooked anything with Matcha and need to try some soon. These nuts are a great way to snack healthy. Wow – I never would have thought to toss nuts in green tea! So creative and adding that sugar makes for a nice sweet, yet pretty healthy, treat! Candied nuts are such a tasty treat. Seasoning them with green tea sounds like a great twist! I love snacking on nuts and you have added a fantastic spin! Can’t wait to give these a try! Candied nuts are such a great snack! This sounds like a great recipe! I do have Matcha green tea at home and have been wondering how else to use it so it’s serendipity indeed that I saw your delish recipe! Love this! Yay 🙂 Glad I could be of help! Wow.. never thought of adding great tea to my candied nuts.. Sounds so good. !! Can’t wait to try. This is genius! I can’t wait to try it. It sounds positively addictive! It is 🙂 We have gone through more batches than I care to admit! I’ve never seen anyone season nuts with green tea before. it’s a great idea, and I love how simple it is sounds to do. To be honest neither had I until we noticed them at costco 🙂 They are delicious though! I am so in love with this recipe! I need to find a friend with a Costco membership stat just to stock up on tea haha. Pinning until that day comes. Haha 🙂 We are costco addicts!! I love snacking in between meals, these nuts sound great. An interesting combination of flavours, l wouldn’t have thought to use green tea, but they look so appetising, worth trying for sure. Oh good idea, I never think to gift candied nuts, but that would be perfect seeing as I am ALWAYS making them!